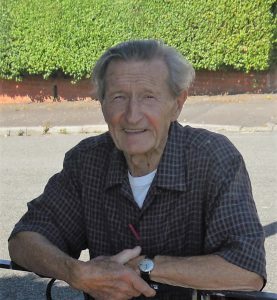 Tributes have been paid to John Harries, Tycoch, Swansea, a long-standing member of Plaid Cymru, who died in August at the age of 93. John became an RAF pilot towards the end of the Second World War when he saw service in the Far East before returning home to qualify as an architect, working in London and later, Swansea. He was appointed resident architect to the University in Swansea, where he worked until his retirement in 1982. His family roots are in Dinas Cross in North Pembrokeshire, and John liked to remind people that he was the most senior member of Capel Tabor in the village. He was brought up in a number of places in south and west Wales before his family moved to London, where he was educated in Streatham school. He married Gwenda, his first wife 1956 and they had two sons – Huw, who now lives in Switzerland and Bryn, who resides in London. Gwenda sadly died at a young age, and in 1970 he married Joy who died in 1996. John remained active until recent years, playing a valuable role in Plaid Cymru campaigns in his eighties. Former Plaid General Secretary Dafydd Williams said that John would be always be among the first to arrive to help in Parliamentary by-elections – invariably with a large Red Dragon flag flying from his car and a loudspeaker putting out Plaid’s message. 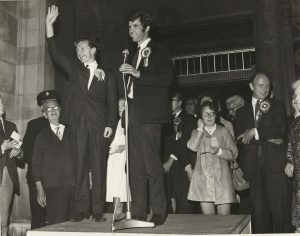 John Harries (left) with Plaid Cymru’s Swansea West Parliamentary Candidate, Guto ap Gwent, in the election count in the 1970s. John’s technical know-how meant he was ideally qualified to take responsibility for the stage settings of Plaid Cymru’s Annual Conference – and create a backdrop the big parties would have paid tens of thousands of pounds to emulate, he said. Instead of a host of PR companies, marketing agencies and graphic designers, Plaids conference set depended on John Harries, who took full charge of designing, planning and building the staging in his garden hut in Tycoch, Swansea. “John was a dedicated nationalist with strong radical views – and he believed in working to make his vision a reality”. This entry was posted in Newyddion Blaen, Tribute on 23/10/2018 by Rheolwr Gwefan.